More and more people have made it a point to incorporate healthy eating practices within their daily lifestyles. While healthy eating can greatly improve a person’s overall health and well-being, even too much of a good thing can bring on unpleasant consequences. Orthorexia nervosa symptoms develop in cases where a person has taken healthy eating practices to the extreme, according to the U. S. National Library of Medicine. As one of the newest eating disorder types, people displaying orthorexia nervosa symptoms place an unusually high importance on eating healthy foods. According to Iowa State University, the term “orthorexia nervosa” literally means “fixation on righteous eating.” As with any fixation or obsession, orthorexia nervosa symptoms can be fairly easy to spot. According to Northwestern University, orthorexia nervosa symptoms take on an obsessive-compulsive pattern that eventually takes over a person’s life. In general, obsessive-compulsive behaviors bring on unwanted consequences in a person’s life. In many cases, a person starts out with the intention of improving his or her health by eating healthier foods. Over time, this intention turns into a compulsion, at which point the initial reason for eating healthy gets lost in the obsession. Orthorexics abide by a rigid eating style that emphasizes natural, no fat, no sugar foods as well as other wholesome or “pure” menu plans. Someone battling orthorexia nervosa symptoms has attached his or her sense of worth and self-esteem to the practice of eating healthy foods. While there’s nothing inherently wrong with deriving a sense of esteem from living a healthy lifestyle, people with orthorexia will actually experience feelings of guilt and self-loathing when they slip-up and eat something they consider unhealthy. 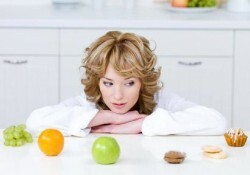 Orthorexia develops from an obsession with eating healthy. Not surprisingly, this level of dedication takes energy, focus and time. As a result, a person starts to spend less and less time with others. Being restricted to healthy foods only also prevents a person from dining out or eating at a friend’s house. Not unlike the consequences associated with anorexia nervosa eating disorders, people struggling with orthorexia nervosa symptoms experience unforeseen health consequences, such as inadequate sodium intake, hormone imbalances and impaired metabolism processes. Ironically, a person’s initial intention to eat better and improve his or health can reach a point where serious health issues start to develop. In effect, the practice of eating healthy becomes more important than any negative consequences that result. An initial desire to achieve better health through healthy eating practices hinges on a belief that certain foods can make a person sick or unhealthy. Over time, the obsession behind orthorexia nervosa symptoms develops into an overall fear of food. As symptoms worsen, orthorexics eliminate more and more food types from their diet for fear of becoming sick.